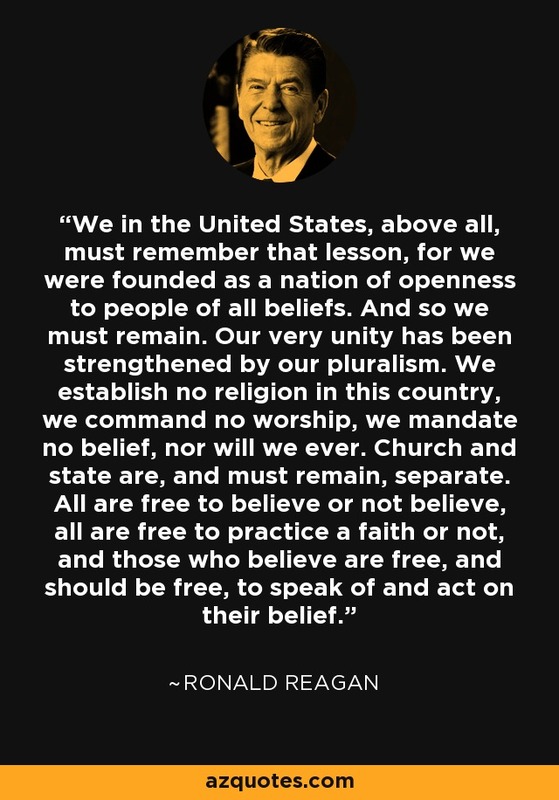 We in the United States, above all, must remember that lesson, for we were founded as a nation of openness to people of all beliefs. And so we must remain. Our very unity has been strengthened by our pluralism. We establish no religion in this country, we command no worship, we mandate no belief, nor will we ever. Church and state are, and must remain, separate. All are free to believe or not believe, all are free to practice a faith or not, and those who believe are free, and should be free, to speak of and act on their belief. Ronald Reagan's Remarks to Members of the Congregation of Temple Hillel and Jewish Community Leaders in Valley Stream, New York, www.reaganlibrary.gov. October 26, 1984.